The MADI channels are transferred from and to 8 ADAT optical inputs and 8 outputs via TOSLINK. 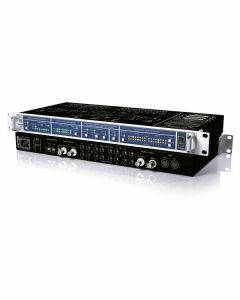 Furthermore, the ADI-648 contains an easy-configurable 8-Channel 16x16 Matrix Router. Any of the outputs, which are divided into 8-Channel blocks, can be fed from any 8-Channel input block, both on the ADAT and the MADI side. With this, there is not only free routing within the M-A and the A-M conversion, but also splitting and routing within the same format. An 8-Channel input block can be routed to any number of output blocks in parallel. Using more than one unit, several MADI signals can be combined to one (merging).